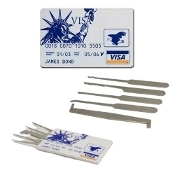 Credit Card Lock Picking Set "James Bond"
Credit Card Lock Picking Set "James Bond" is the newest and perhaps most convenient way of carrying a lock pick set. The lock pick set is housed inside a realistic looking credit card that can be easily carried inside a wallet/purse. The back portion of the card slides off to reveal four individual stamped stainless steel picks (half diamond, short hook, snake rake, and single sided) along with a double-sided tension tool.